The title of this article, a quote from the Robert Frost poem “Mending Wall” is one I have used frequently in my practice when trying to encourage clients to memorialize agreements in writing. Nonetheless, there are always instances where clients take the position of the narrating neighbor in the poem that “something there is that doesn’t love a wally”, or more specifically, a contract. Often times, this sentiment is backed by an explanation of a party’s close relationship, the satisfaction of a warm handshake, or a familial relationship between the parties; harkening back to the “blood is thicker than water” proverb. Unfortunately, contracts, which can serve as a wall, outlining the boundaries of the respective parties’ obligations, consistently prevails over blood in the Courts. A recent decision from the Sixth Circuit Court of Appeals illustrates just how contracts may aide in keeping Thanksgiving dinners and get togethers much less awkward. In Holloway v. Bucher the Sixth District Court of Appeals had to determine whether an oral agreement between the Plaintiff, Janet Holloway, and her daughter, Suzanne Bucher was enforceable. The circumstances were noble enough. Mrs. Holloway agreed to loan her daughter $163,800.00 at an annual interest rate of 1 1/2 % in two (2) installments. The first installment was to allow Ms. Bucher to pay off her home equity line so she could sell her residence, and the balance was given to Ms. Bucher to acquire a new property. Ms. Bucher did go ahead and pay off her home equity line and sell her first residence, applying some of the proceeds from the sale of the first residence to the outstanding balance to her mother, and commenced making monthly installment payments. Indeed, the parties had discussed payments in the amount of $300.00 a month until the first residence was sold, with the payments then increasing to $500.00 a month. This arrangement held true for several years, until Suzanne stopped making payments. Apparently, Suzanne had lost her job, and her mother graciously agreed to a forbearance until she could get herself back on her feet. However, at some point Mrs. Holloway became disenchanted with her daughter’s efforts to find employment. This disenchantment ultimately led to her filing suit against her daughter for the balance on the unpaid oral contract. Now, oral contracts are in fact enforceable. However, Ohio and many other states also recognize a principal known as “the statute of frauds.” The statute of frauds is codified in Ohio under Revised Code 1335.05, and the doctrine precludes the enforcement of oral agreements that cannot be performed within one (1) year. The sticky wicket in the dispute between Ms. Holloway and her daughter, because the agreement wasn’t in writing, was whether or not this was an agreement was clearly covered by the statute of frauds. Ms. Holloway argued that the loan could certainly have been repaid within a year, and used as evidence the fact that her daughter had paid a portion of the profits from the sale of her first residence to apply to the loan balance. However, the Court found that since the parties had also expressly contemplated monthly payments in the range of $300.00 to $500.00 a month that, as a matter of law, the contract was not one that could be performed within a year. As such, it was subject to the statute of frauds, meaning that if the contract was not in writing, there was no agreement for Ms. Holloway to enforce. Accordingly, Ms. Holloway’s noble gesture left her without recourse to the tune of approximately $100,000.00. 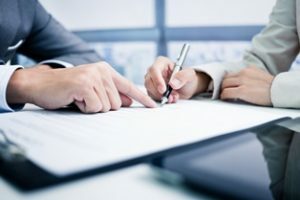 The moral of the story of course is to “get it in writing.” Whether you are dealing with a loan to a family member, helping someone get on their feet after a setback or helping someone relocate after a divorce, if you have any intention of being repaid, the arrangement should be memorialized. Agreements can always be modified, and just as Ms. Holloway had extended to her daughter, forbearance is always an option. However, like the wall in the Robert Frost poem that delineated the neighbor’s boundaries, a contract can remove doubt as to each parties’ respective obligations. If you have any questions about this article or are in need of a contract, please contact Mike Sandner at msandner@pselaw.com or call 937-223-1130.